Below are some of the optional features we have available. If you have something specific you are looking for, please contact us with the details. 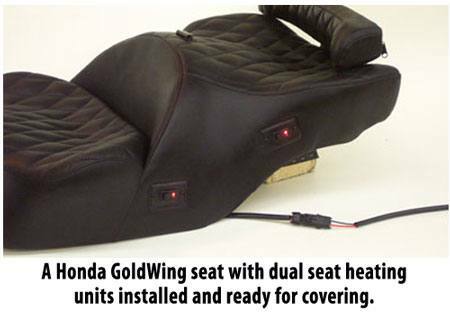 We offer a heating system for any motorcycle. 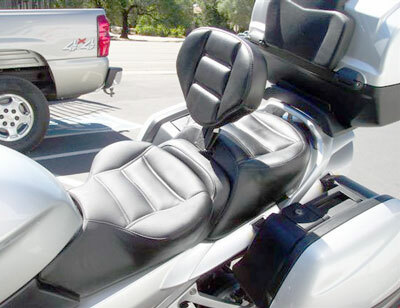 Each seat unit is equipped with a thermo switch that keeps the seat at a comfortable 103-107 degrees. 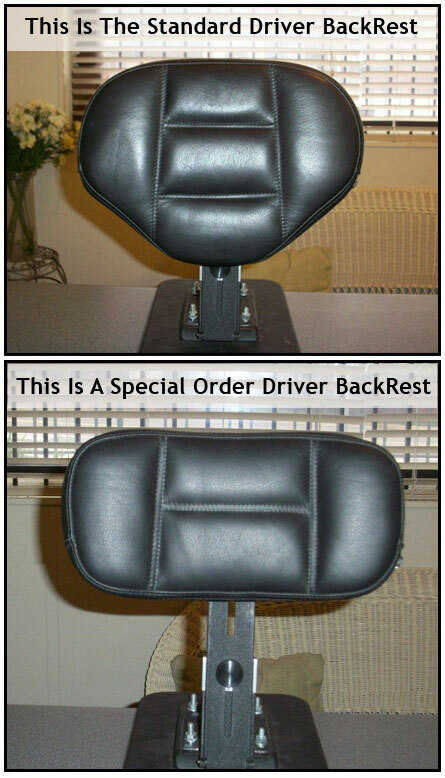 A seperate On/Off switch is installed on the seat for driver and passenger, with a dual application. The heater connects easily to the battery with quick disconnects. For accessories connection, please contact your dealer. Each unit draws approximately 1.5 amps. This is not a constant draw as when the heater reaches it’s temperature, the thermoswitch turns on and off. 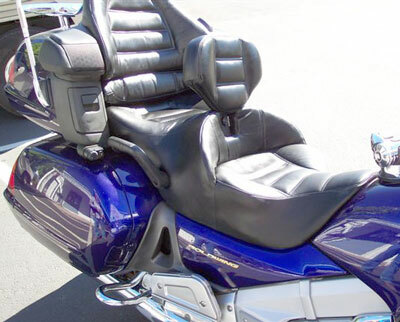 You will love this new addition if you are a cold weather rider and love the comfort of a warm seat! 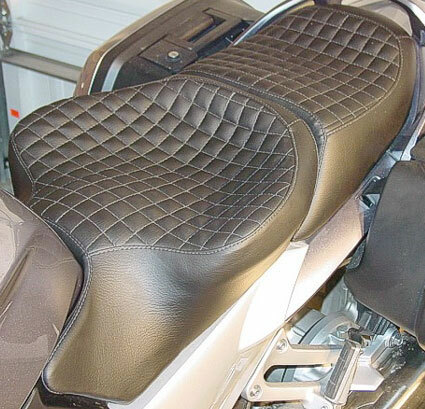 Other pictures of backrests can be seen in these photographs: Yamaha FJR1300, BMW R1150R and Honda GL1800. All Vinyl: The most durable, weather resistant and generally carefree choice, and offers the best color match for most stock seat cover colors. 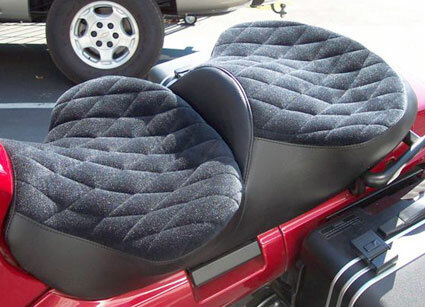 Velour Inserts: Vinyl sides with 100% nylon velour inserts in the saddle area, where the riders come in direct contact with the cover. This combination is very breathable. 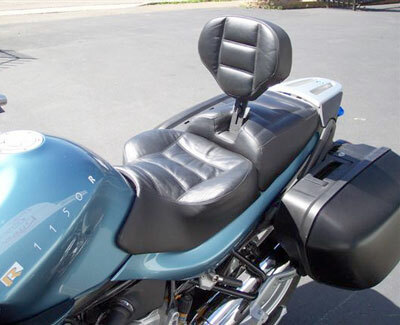 Leather Inserts: Joins the durability and color selections of vinyl for the sides of the Saddle with the luxurious feel of genuine leather in the seating area. Leather is easier to keep clean and more water reistant than velour. Being a naturally porous material it “breathes” better then vinyl. Protected from the elements and periodically treated to restore its natural oils leather will outlast even the heaviest vinyl. All Leather: For the connoisseur of fine, richly appointed motorcycle accessories this is the only way to go. The additional effort required to protect, clean and condition an all leather Saddle is a small price to pay for the soft, supple, luxurious feel and appearance of genuine leather. Sunbrella Acrylics: Sunbrella is a breathable, durable canvas product that has been used in outdoor marine and awning applications for years. It is naturally water resistant and will not fade. Sunbrella will hold you in the pocket and help eliminate slide forward problems. A wide range of colors are available for use. Small Squares will provide a cooler ride on an all vinyl cover because the stitch lines trap more air between you and the cover, and the needle holes allow some air to pass through the vinyl. 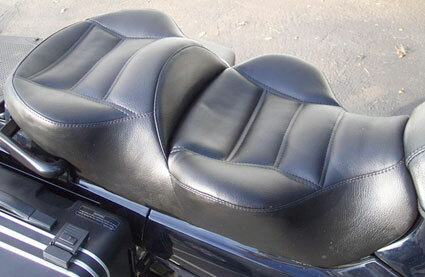 The Small Diamond pattern, the Large Diamond pattern and the Rectangle pattern will more closely resemble the stock patterns of most motorcycles, reducing the need to recover backrests for the sake of a better match. The Half Moon. 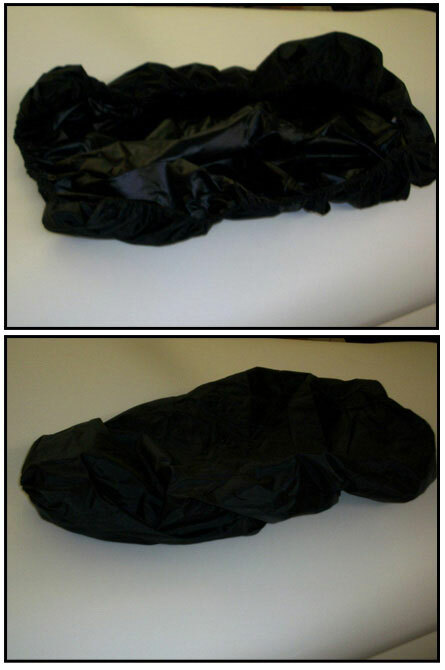 It has the least amount of stitching and is the most water proof. Not available with Sunbrella Inserts. Rain covers are advised for all seat cover choices, including all vinyl, since the sewing machine needle holes render them less than 100% waterproof. Our rain covers are made from double coated nylon with little or no stitching except where the bungee cord is sewn into the perimeter. This is a non-refundable item. 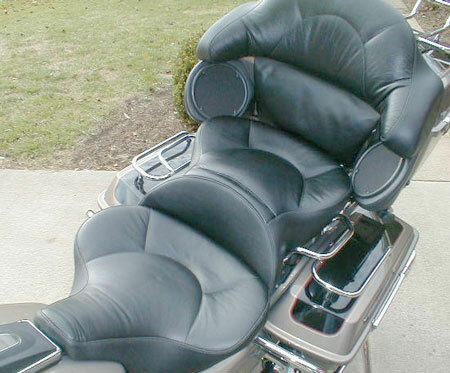 Bring yourselves and your motorcycle to our shop, and we’ll build and install your “Day-Long” Saddle all in one day. This arrangement is strictly by appointment, and there is an extra charge (see Prices). This process allows you to test sit the seat for comfort and make adjustments as needed before the seat goes to the covering department. Appointments are accepted for Tuesday through Friday only and require you to be at our shop at 8AM PST. Due to the time factor involved to build, sit test, and cover your seat, we are limited to the extent of additions that we can offer. 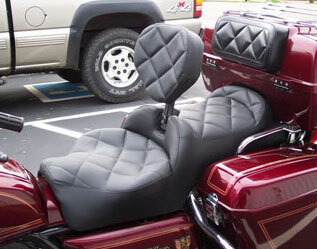 The RCP driver backrest and the seat heaters are the only options available for Ride-In services. Special pattern designs, Embroidery, and/or Studs are not available during the 1-day service. Two Tone / 1 color insert, 1 color side boxing is acceptable on a Ride-In. We carry Blacks, Grays, and Browns in all of our materials, if you’d like a different color, please let us know ahead of time so we can have it in stock. The openings are limited and fill up quickly in the spring and summer months, so please call early if you want an appointment. Campgrounds and motels are available close by. We are located at 800 feet, so winter weather is usually not a factor. Summer weather gets very hot 105+, so please be prepared if you schedule from June through September. Upon booking your ride-in appointment a deposit of $80.00 is required. Russell Cycle Product requires a 72 hr. (3 business days) notice of cancellation or reschedule. The refund back will be 50% of the deposit. If you fail to contact us with-in the specified time your deposit will be forfeited. If you need to reschedule your appointment you can reschedule to available dates and your deposit will be carried over, if this is done more than 72 hours in advance. Re-schedule must be done the same year of your original appointment and cannot be carried forward to the next season.